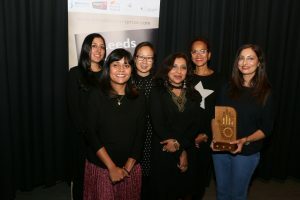 Second prize was awarded to Yvonne Singh for One Man’s Revolution and third prize was awarded to Kavita Bhanot for Baba ji on Boulton Road. A panel of 22 Soroptimist International members chose the winner of the 2018 SI Readers’ Choice award, which was presented to Omega Douglas for Hibiscus, Rose, Jacaranda. Shortlisted writers Mona Dash and Yoanna Pak gave captivating readings from their entries and the whole cohort received a package of fantastic prizes and opportunities through the Prize Plus programme, ranging from a place at Arvon’s residential writing course, manuscript through The Literary Consultancy, 1:1 writer development through Peepal Tree Press’s Inscribe programme and attendance at New Writing North’s summer salon event for agents and publishers. Huge congratulations to all our shortlisted writers – find out more about them here and read extracts of their work. There are two more events featuring the shortlist in London this month – see more details here.